September | 2008 | WHATEVER! Intellectual dishonesty? Yeah, and politics as usual. Further to my last post, the demonstration of politically motivated intellectual dishonesty is absolutely astounding in the last 20 hours. But the dishonesty of the democrats’ comments lie in the fact that their party had the necessary votes to pass the bill from within their own party conference. However, owing to the unpopularity of this bill, some democrats were explicitly given permission by the Speaker to vote against it, so as to avoid fire from constituents in the upcoming elections. The bill failed to pass by only 12 votes. Out of 235 democrat members of the House, 95 voted “No.” 95! The democrats couldn’t get 12 of those 95? So, it’s the republicans fault? Further, with respect to Nancy Pelosi, 15 democrat representatives from the California delegation, HER state, voted “No” on the bill. [For any democrats who may be reading this, to make the math simple for you, that is 3 more than the 12 needed to pass the bill.] And of the 37 democrat members of Barney Frank’s House Financial Services Committee, the one that was principally responsible for writing the bill, 12 voted “No.” As chairman of this committee, he could not get these votes from his own party and his own committee to pass the bill that they created. What is wrong with that picture? Can you not see the intellectual dishonesty in trying to paste the defeat of this bill on republicans? This whole matter lends credibility to the old joke. A: When their lips are moving! The democrats are AT BEST telling half truths about the voting results for H R 3997. How can you tell? When they try to explain the bill’s defeat, their lips are moving! P.S. : To too great a degree, that old joke applies to the republicans as well. Frankly, I am convinced that no one in Washington can be trusted to speak truthfully about political matters. 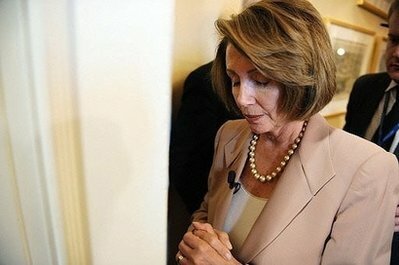 Can anyone say “Term Limits”? I don’t trust these people! The U.S. Congress has been experiencing historically low approval ratings for a long time now, really since the mid-term elections in 2006 when the democrats gained control of both the Senate and the House of Representatives. These low ratings must surely be a reflection of the lack of confidence and trust we have for them. AT least that is the case for me. This link will take you to a website recording the results of the House of Representatives vote on the so-called bailout of Wall Street that was taken on September 29, 2008. This is as published by the Clerk of the House. Check out the “Bill Title” found on the third line of the body of the page. * Does this “Title” appear to describe the matter that is supposed to be dealt with by the commitment of 700 Billion of your and my dollars? The image below must surely represent the feelings of our founding fathers at what has become of the country that they fought and some died to establish! Shame on us! A look to our own future in the U.S.? So says Baroness Mary Warnock of people suffering dementia, suggesting that these people should be euthanized, put down, killed, according to an article today at Al Mohler’s blog. This article sheds light on a frightening development in Great Britain and their nationalized health care system, more accurately described as “socialized medicine.” Frightening because, given our apparent passion for the concept of national health care in the United States, we could be looking at our own future as well, both as a nation and as individuals. The reality of any insurance program is that the payer of benefits (that is the insurance company), and not the payer of premiums (that’s you and me) determines the type, amount, and degree of service that will be covered by the benefits of the policy. If you have private health care insurance now, that is the case. For example, most insurance plans that I am familiar with have different levels of coverage (direct payment or reimbursement) for services provided within their so-called network, and lower levels of benefits for services provided by clinicians outside their network. This is done according to contractual relationships that the insurance companies have with providers, and to some degree I am convinced on the whim of the insurance company itself. Such will be the case with any form of national health care that is being discussed in this current presidential election season. Don’t believe me? Just take a look at Medicare today. And that is just a dip of a toe into the waters of socialized medicine. The government already does, and increasingly will determine the type, amount and degree of service that will be provided. And you can rest assured that when there is the least strain on the system, as will doubtlessly be the case with the aging of our U.S. population, diminished coverage will be a reality. And it seems inevitable that the type of dialog taking place in the U.K., will take place here as well. Will it be within 10 years of the implementation of socialized medicine in the U.S.? I don’t know. Maybe it will be 15 or 20, or even 30. But I can say with virtual certainty, that it will happen, and with that eventuality, everyone reading these words today could be subject to being euthanized under the sort deranged system of social engineering that will be an economic consequence of socialized medicine. Socialized medicine, which I fear will be a reality as our republic slips ever closer to Marxism, is just as great a farce as the Ponzi scheme normally referred to as “Social Security.” In fact, as the elderly become more and more expensive to maintain in the economy of our increasingly socialist society, the demands of both of these systems may converge and meet at the point in which the catheter meets the vein delivering the Euthanyl. When it comes to books, I am seldom ahead of the crowd in terms of getting them read before the masses. When Sinners Say “I Do” is not a new book. It was published last year (2007), and for some of my readers, this book may be old news. Still, after finally reading it, I am pleased to recommend it to any of my readers who have not already done so. And for those who already have, I would love to get your feedback on how the book impacted your understanding and if you are married, how it has changed your perspective on your marriage relationship. Books on the subject of marriage must surely number in the thousands, maybe tens of thousands. And, I have read relatively few of them. In fact, the only ones I can distinctly remember reading are The Exemplary Husband and The Excellent Wife. Both provide very good instruction from a scriptural perspective about the individual roles of husband and wife. Not surprisingly, I enjoyed The Exemplary Husband more than its companion for women, but I read The Excellent Wife so that I could confidently recommend it to the young women I have contact with, who are looking forward to marriage, either imminently, or simply looking to the future. In When Sinners Say “I Do”, author Dave Harvey goes beyond simply telling the reader what scripture says about the roles and responsibilities of men and women in the bonds of marriage, he diagnoses the root problem that is present in ALL marriages…both spouses are sinners! 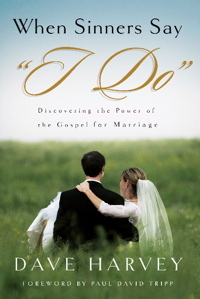 With wit, humor and wisdom he helps couples apply the truth of the Gospel to the marriage relationship. And in so doing, he helps married couples strengthen the bonds of marriage and to see their potential to glorify God in their covenantal relationship. Not a difficult read, and at 183 pages in length, not one that will take a great deal of time to tackle. Every married person should read this book, unless of course you are not a sinner. Oh, what’s the next generation coming to? One of the ways in which God has chosen to bless me is with the privilege forming relationships with a bunch of college-aged young people every summer. It would not be at all incorrect or unflattering to describe these young men and women as “ordinary” on a variety of different levels. They come from a variety of family backgrounds, and financial circumstances. Their faith backgrounds and upbringing vary from devout to virtually non-existent. They have many different academic interests and career aspirations. Some are fastidious in their appearance, (all of the ladies, and some of the guys), while a few sport sort of a “college scruffy” look ( none of the ladies and some of the guys). In lots of ways, they seem just like every other young person on a college campus. And if the setting was a classroom, or just seeing them walk across campus, you’d probably never pick my friends out from the others. But they are all far from “ordinary”, in fact they are exceptional in the sense that have a profound awareness of a personal calling, and it is a calling that they are responding to. They all profess a faith in Jesus Christ, and a willingness to serve Him, despite the alternative pursuits that are available to them and how they could choose to spend their time away from school. And some go from there, to vocational ministry. I met two such guys during the summer of 2003 and have maintained a relationship with them ever since. They are brothers. I can say that both of them have served to encourage and challenge me to a much greater extent than I could ever imagine I may have done in return for them. In the relatively short existence “WHATEVER!”, I have linked to their two separate blogs, and now to their shared blog “irruption.” I commend their site to all of my readers. Because of other commitments, they do not always post on a daily basis, but their site is well worth linking to, or adding to a reader. As you get a glimpse of their minds and their spirits, note that these two guys are only in their mid-twenties! They are both wise beyond their years. One brother has completed his M.Div. and is currently pursuing doctoral studies in New Testament. The other is still studying for his M.Div. in Christian Ministry and, as you will read, is exploring God’s call to plant a church in Philadelphia. Since I am in my mid-fifties, and they in their mid-twenties, that makes them the “next generation” for me. And, in answer to my own question in the title, THIS is what at least part of the next generation is coming to. You’ll be informed and inspired! My first exposure to Boris Johnson, mayor of London, occurred during the closing ceremonies of the 2008 Olympic Summer Games in Beijing. His role was minor, but full of symbolism. He marched onto the stadium floor of the “Bird’s Nest” along with Jacques Rogge, President of the International Olympics Committee, and Guo Jinlong, mayor of Beijing. In the ceremony, Rogge took the Olympic flag from Guo and handed it to Johnson. Deal done. Games move to London in 2012. At the time of the ceremony, I mentioned to my wife, who was watching with me, that Johnson seemed somewhat awkward, particularly during the procession into the stadium. He wore a poorly fitting suit, with jacket unbuttoned, and his hair was a tousled mess. This was in stark contrast to the neat and tailored appearance of Rogge and Guo. As a marketing guy, I thought it was odd, given literally the global audience for the closing ceremonies, that Johnson’s handlers did not see to it that London was put in a better light. After the closing ceremonies, Johnson appeared at a London 2012 party in Beijing and made about a 4.5 minute speech. It was a thoughtful energetic message, acknowledging the athletes of Great Britain during the 2008 Games and looking forward to the Games in London. Here is a short excerpt from that speech. I will be the first to say that for whatever Boris Johnson lacks in sartorial splendor, he makes up for it in insight and enthusiasm. I think you will find his message is both informative and inspirational. LIsten and learn. As a person whose bloodlines find their origins in the countries now known as the United Kingdom of Great Britain and Northern Ireland, I could not be more happy for, or proud of the land of my forefathers. I mean, who knew??!! You are currently browsing the WHATEVER! blog archives for September, 2008.